16 MB RAM, 256 MB Preferred. Download the installer program from this website to your hard drive. If you haven't yet purchased the software, please visit our online order desk. You will be unable to register and activate the software until you have submitted your payment. If you have already paid for the software, please continue to the next step. If you have not already done so, download the installer program to a temporary location on your hard drive. When prompted with the following screen, click the SAVE button, and place the installer program onto a folder, for exampe C:\My Documents, C:\Temp, C:\Download, or any other folder of your choice. 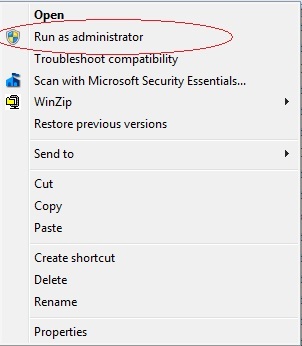 If you have Windows 7 or Windows Vista, you must RIGHT-CLICK on the installer program which displays the popup menu shown below, then you must click "Run As Administrator". For more information about why this step is critical, you can read this article in our forum. Click "Next" on each of the following screens to copy files to your computer. MPORTANT: When the installation is complete, the G1000 files are copied to your computer's hard drive, but the panel will not be visible in Microsoft Flight Simulator until you complete the remaining steps in these instructions. C) You may accept the current installation folder and begin installing files immediately by clicking "Next". Otherwise, if you want to change the default installation folder, use the "Change" button to select a different folder, then click the "Next" button to begin copying files. IMPORTANT: When the installation is complete, the G1000 files are copied to your computer's hard drive, but the panel will not be visible in Microsoft Flight Simulator until you complete the remaining steps in these instructions to activate the G1000. Pick the registration option appropriate for you. If you are a brand-new customer, pick the first link to start your registraiton and activation. If you already previously registered, then use the instructions in the second link. > Registration and Activation Instructions for New Installs <-- New Customers Go Here!